Yes. I ate my heart out in lahore instead of posting recipes like I said I would. And yes, I miss it like crazy. The dinners, the cafe’s, the family, friends, and FOOD. That’s why I’ve taken it upon myself to make myself feel better with food. Who says you need to have a party to make party food? No one. So here are a couple of recipes that are great for a party, of course, and great just for you too. A lot of people don’t realize how easy it is to make cole slaw. I use 4 ingredients. That’s it. And it tastes delicious every time. You literally mix everything together. This is the basic recipe. You can add walnuts, seasoning or raisins if you want, but the bbq sauce takes care of adding flavor. This one is my favorite. I sometimes make it on it’s own and have it for lunch. It’s tastes fresh and you can add any vegetables you like. Cool the boiled pasta shells and potatoes. If you want the carrots to be soft add them to the potatoes when they’re almost done. I use frozen peas so I usually add the peas and carrots to the boiling water when there’s about 3-5 minutes left of coking time. In a large bowl mix the mayo and mustard. Then add the pasta and the vegetables. Mix and season to taste. Add the roasted peanuts just before serving. It’s actually better to sprinkle the peanuts on top. If the salad looks like it could use more mayo, add one T, or add some cream. Serve chilled. No one likes a warm pasta salad! 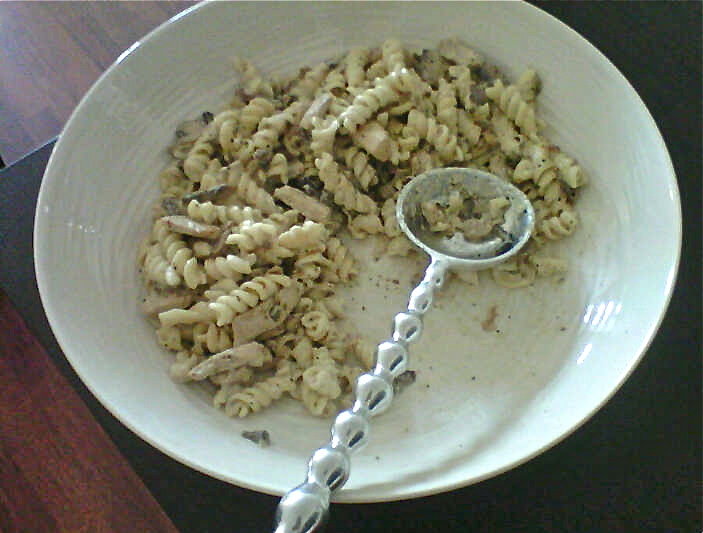 Day 3 means Rattle Snake Pasta! This is my version of a delicious pasta that’s served at a restaurant called Gun Smoke in Lahore. Serve it with some garlic bread and a house salad and it’ll make the cut for your weekly menu for sure! Start off by marinating the chicken in the soy sauce, mustard, vinegar, and salt+pepper. You don’t have to wait a long time, just until the pasta is done. Once you drain the pasta don’t rinse it through. That washes all the starch out, which actually helps the sauce stick to the pasta. Heat a little oil in a pan, i’d say about 2 Tblspn and cook the chicken until it’s golden brown. Then add the chicken stalk, flour and cream. Mix the flour in really well before the sauce starts bubbling so it doesn’t clump. Once the sauce starts boiling around the edges add in the jalapeños and keep stirring until it starts to thicken. Don’t let it thicken up too much, because once you add the pasta there won’t be enough sauce to coat it all. But before you add the pasta, taste the sauce and see if it needs more seasoning, because adding the cream does dull down the flavors. Serve this pasta warm with lots of garlic bread.